If you’ve seen Banksy’s Exit Through the Gift Shop documentary, you’ll know a little about his protégé Thierry Guetta – the French born Los Angeleno who has taken over London’s cavernous Old Sorting Office with his bizarre brand of pop art. 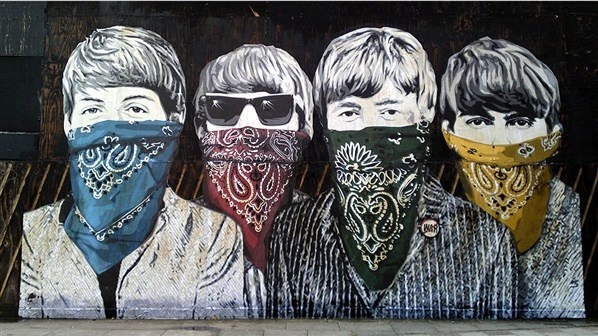 If you haven’t seen the film, this exhibition will tell you all you need to know about the man who calls himself Mr Brainwash – he’s a little bit bonkers. Multicoloured homages to Banksy, Andy Warhol and street art in general bedeck the walls from floor to ceiling – at least we assume they must be tributes, it’s impossible to tell if Guetta pertains to be a serious artist in his own right or if he’s actually the product of a satirical Banksy prank. Or is he just ripping off pop culture left, right and centre? Nobody really knows, and perhaps that’s part of his mystique. Leaping, paint splattered horses cavort in the centre of both rooms, iconic images of Michael Jackson and Lenny Kravitz are constructed with broken vinyl records and giant radio and toy car models sit amongst row upon row of slightly altered and distorted pop art images. It’s colourful, in your face and confusing. People mill about snapping pictures of Beatles, Kate Moss and Madonna images, or pose by Darth Vader and Yoda figures at the entrance, next to a ‘May The Art Be With You’ slogan daubed on the wall in red paint. You can actually sit on some of the installations and there’s an aura of mass produced kitch in the air. There’s just so much going on, each individual piece of art is cluttered and brash and there are so many of them, yet with all this happening it’s still difficult to determine what exactly the exhibition is saying, if anything at all. Initially it’s tricky to comprehend how one man can produce so much material, although you get the impression that the time/effort ratio for each piece isn’t huge, and with rumours of a vast production team it seems that Guetta is more an artistic director than a man who single-handedly put together such a big show in just three weeks. Upbeat, if slightly bland, messages pepper the walls – infusing the rooms with a sort of blind sense of optimism. 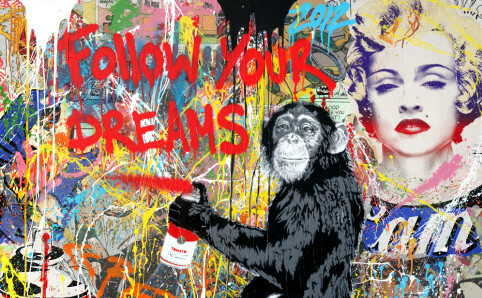 ‘Life is beautiful’ shrieks a pink wall mural, while elsewhere a monkey stencils ‘Follow your dreams’ on a graffiti saturated wall, with a spray-can. All the colour and positivity is enough to cheer up the most miserable of souls, and the crowds gathered seem charmed by their neon surroundings. Having been called derivative, repetitive and insipid by a multitude of art critics, the disconnect between the critics and the general public’s view of Mr Brainwash is palpable here – I can’t spot a single person that doesn’t seem to be enjoying the show. Guetta’s art works have completely confounded the art world since 2008 when his first LA show attracted more than 50,000 visitors and was extended for three months. Guetta’s infamous description of himself as ‘Banksy’s biggest work of art’ has done nothing to dispel widespread speculation that Mr Brainwash is in fact part of an elaborate prank being pulled by the Bristolian stencil artist, to make a statement about the commercialisation of art. If this is true, multiple million dollar sales and sold out exhibitions would say the ‘brainwash’ effect has worked. While jovial, fun and completely off the wall, this exhibition offers no concrete answers as to whether or not we should take Mr Brainwash seriously as a credible artist. I have no idea if what I witnessed was the product of one man’s inexhaustible energy and optimism, or an offshoot for a wider comment about the state of the art industry today. However, if all you really want is to have your photo taken standing next to a giant gorilla made out of tyres, then you’re in for a treat. ← All about the money?